Man it’s hot in DC. Yesterday was bad but supposedly today has been worse. But guess what? My new apartment has a community pool right outside our back door! I’m moving Thursday and Friday so tomorrow is likely my last post for the week. I’m not sure when we’re getting access to the internets at my new place. Is anyone else as shocked as I am that Andre Agassi is defecting to Adidas or am I just showing my true nature as a certified tennis dork? Agassi was easily one of Nike’s most identifiable faces for the last seventeen(!!) years. Although I do want to go on record and state I NEVER had a pair of those hideous hot pink/denim combo shorts he used to wear. Even I draw the line somewhere. 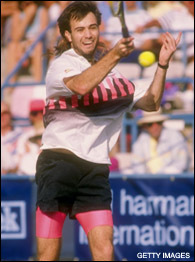 But I used to rock the latest Agassi model Nike’s in high school, especially after Tennis Jesus retired. 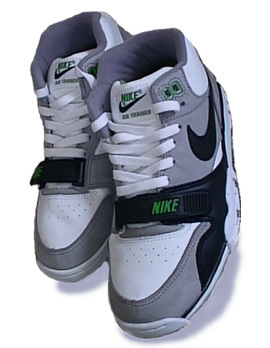 I used to rock those Bo Jackson‘s too (but mostly because Johnny Mac was in those “Bo Knows” commercials). They were tight in the late 80’s/early 90’s. But the undisputed best shoe ever has to be the Air Trainer One. I will not argue this. Speaking of unthinkable. Is Darko on the block? For Al Harrington? Al…Harrington? Jack Nicholson bans all Celtic gear from the new movie he is shooting(see sidebar). In Boston. Lo and behold, it has come to pass. New iBooks and new Mac Mini’s. Forbes says ‘Holla at ya Gothamist‘ in their Best of the Web picks. Yet no mention of the second most trafficked site in the -ist family. Hmmmmm. I am kinda perplexed by their picks in the music category (Hello? Chromewaves and LHB to name two) as well as their sports blogs picks. This isn’t my podcast wishlist but it’s pretty damn close. I have yet to listen to a podcast, but the KCRW ones sound promising. My favorite Bo Jackson commercials were the ones with Dennis Leary in ’em, where Leary said “I think you hear me knocking… and I think I’m comin’ in.” Still throw that line out from time to time, even now.